Subacute combined degeneration (Lichtheim disease) refers to a condition that is characterized by the demyelination of the dorsal columns, corticospinal tracts, and spinocerebellar tracts. This particular condition is caused by vitamin B12 (cobalamin) deficiency. The lack of vitamin B12 in some way seems to impair/result in the decrease of myelin. The nerves of the dorsal columns, corticospinal tracts, and spinocerebellar tracks can become demyleniated. 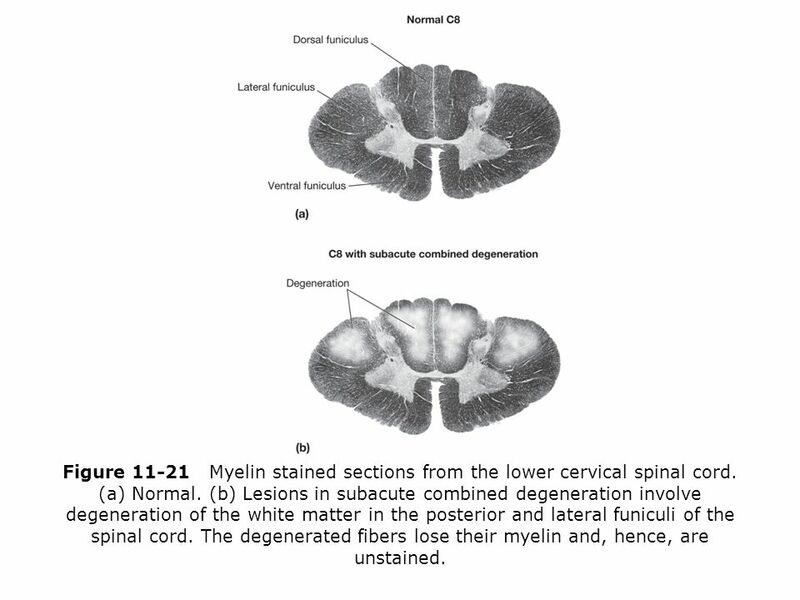 The location of this demyelination (occurs in a patchy random distribution in this disease) will dictate the patter of symptoms seen (including personality changes, weakness, sensory loss). This condition becomes most problematic when it is not treated and the patient develops irreversible nerve damage. Fatigue secondary to the anemia caused by vitamin B12 deficiency. Weakness in the upper and lower extremities. Bone marrow aspirates (if performed) can show the presence of megaloblastic cells. 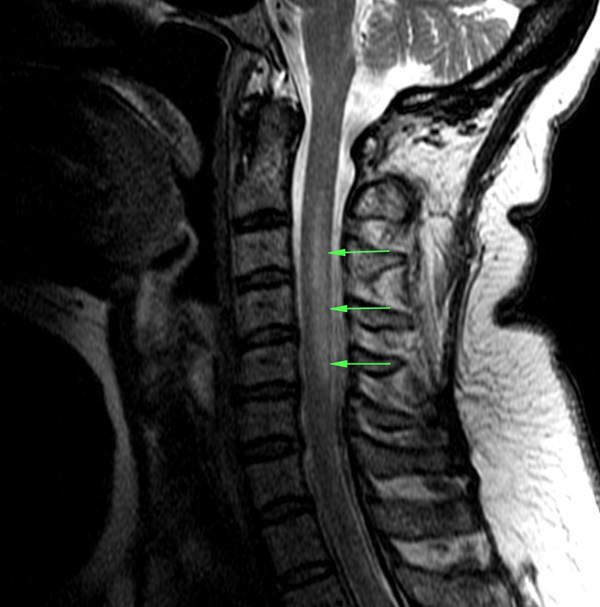 Magnetic Resonance Imaging (MRI) can show findings of increased T2-weieghted signal intensity in the spine. Methylmalonic acid levels can help distinguish between folate and vitamin B12 deficiencies (both will have elevated homocysteine, but only vitamin B12 causes increased methylmalonic acid levels. This will depend on how quickly this deficiency is detected and corrected. It can cause irreversible damage if left untreated. In patients with both b12 and folate deficiencies correcting the B12 levels first will avoid precipitating this condition. Pernicious anemia can be the cause of this vitamin deficiency. Testing for parity cell antibody’s can help diagnosis this condition. The Schilling test is a test of vitamin B12 absorption that can also be used to try and diagnose pernicious anemia. Irreversible neurological damage if this condition is allowed to progress long enough. Macrocytic, megaloblastic anemia is a result of vitamin B12 deficiency. Methylmalonic acid is only elevated in cobalamin deficiency.